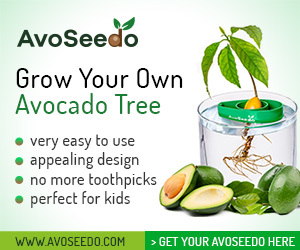 Dwarfing Avocados - AvoSeedo - Grow your own Avocado Tree! Avocados, with their smooth, creamy texture, are delicious and are packed with nutrients. They not only taste good; they are good for you. Unfortunately, avocados are essentially a warm-weather tree, and they grow to a magnificent size that can dominate a small yard. One way to solve this problem is to create dwarf tree. Dwarfing avocados is a little bit of a challenge since one of the normal ways to dwarf a tree is to graft stock from a full-size tree onto stock that will normally grow into a smaller tree. This works fine for apples, peaches and pears, all of which have a small-size version. Avocados, however, come in one size: large. This leaves the grower with the option of dwarfing the tree using what essentially amounts to bonsai growing techniques. The avocado grower should not expect a classic bonsai, however. Trees normally recommended for bonsai have naturally small leaves so that the tree will look natural, even though it is tiny compared to a normal tree of its type. Avocados have broad, beautiful leaves – which is one reason why they make beautiful shade trees in areas where they can be grown to full size. Avocados can be grown from seed or they can be purchased in containers from a plant catalog. Plants grown from seed, however, might not produce fruit – or at least not for a very long time. Avocados that are grown out of doors need to be around nine or ten years old before they begin to produce fruit. One way to speed up the fruiting process is to purchase scions (live twigs) or cut them from a mature tree. These can be grafted onto immature root stock. The mature twigs, once they have grown onto the root stock, will produce fruit on a schedule that matches the parent tree rather than the root stock. Gather the seed from a ripe avocado. Remove the pulp, but try not to damage the tough bark-like exterior of the seed. Place the seed, with the largest end down, into an AvoSeedo floating holder. (This replaces the old-style toothpick method.) Float the holder in a container of water, and in a few days a root will start to form, and then a little green tree will begin to grow upward. As the water level lowers, the container and seed float with it, so that as the root forms it will always remain in water. This increases the success rate of growing an avocado from the fruit you purchased at the grocery store. Dwarfing a tree of any sort usually means placing restrictions on its growing space, nutrients and water. It is a delicate business because the grower will want to shape the tree but not kill it. The Encyclopedia of Organic Gardening recommends placing the growing seedling in the smallest pot possible. Use a mixture of 70 percent loam and 20 percent sand, as you would for a deciduous tree. The pot should be large enough to accommodate the long tap root, but small enough to restrict growth slightly. An 18’ pot with straight sides should do for a starting pot. The tree will need repotted once per year, using a fractionally larger pot. Water only when the soil feels dry, and feed lightly with fish-based organic fertilizer. If the tree seems to be doing poorly, scatter a little extra dry fish emulsion on top of the soil. To graft a mature twig – that is a twig from a tree that produces fruit – onto an immature root stock, select a green, firm scion from the old tree. It should still be showing a little green color and active buds, but should be firm enough to be easily trimmed. Using a sharp pruning knife, cut the twig so that the end of it has a sharp, chisel shaped point with one cut being longer than the other. Next, select a spot on the tree that will provide the root stock, and cut downward from a bud point, slicing about half-way into the trunk. Tuck the chisel point into the newly created cut, with the long side of the cut on the scion on the inner side toward the main trunk. Bind the graft in place with grafting tape, and tie off the end securely. Place a little of the tape over the top of the graft cut to prevent water getting into the cut, as this will cause rot to set up in the grafting site and interfere with the bonding process. 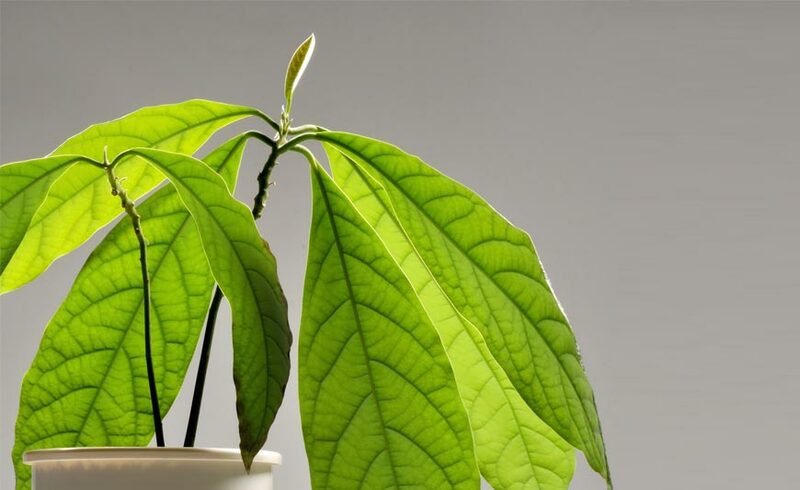 Even dwarfed, and grown inside in a pot, growers can anticipate that their avocado tree will grow to be four or five feet tall. It will make a nice lobby or patio plant. Avocados tend to be self-pollinating, but they are more prolific if there are two trees. If there are no insects available, it might need human intervention for pollination. Periodically, trim the top of the tree and keep it turned to take advantage of the best light so that it will put out branches to the sides and will grow evenly on all sides. Mist lightly and clean the leaves periodically – particularly if your home has a dry heat source. Even if your avocado does not produce fruit, it will make an attractive plant for your indoor décor. With its broad leaves and bright blooms, it is also a conversation piece – particularly if you grow the rootstock from a seed in your own home. Like many indoor plants, it will also help with indoor air quality. Hopefully, however, it will also produce delicious avocado fruit that will help perk up family meals during the seasons when fresh fruit has limited availability at the super-market. If the power goes off in your home, and temperatures begin to drop, create a brace around the little tree and cover it with blankets, a quilt or burlap bags. They are moderately hardy, down to 29 degrees Fahrenheit. This entry was posted in Gardening and tagged avocado tree, dwarfing avocado, grow avocado indoor, mini avocado tree, small avocado tree.